I went into Ori and the Blind Forest... well, blind. I had seen a trailer for it back at E3, but other than that I hadn’t bothered with any information. Nothing against it, I just hadn’t bothered. I came out of my demo session with it at Gamescom a changed man, ready to spread the gospel according to Ori as far and wide as I possibly can, enchanted by a game that looks like it’s going to be... well, brilliant. The sign of a great platformer is one that allows you to be quick, nimble, agile and fluid in motion while at the same time requiring skilled fingers and - crucially - one that responds accurately to your commands. It sounds obvious, but you think about the great platformers - the Marios, the Rayman Legends, the Bubsy the Bobcats... wait, not that one. But you think of how accurate the first two titles are and you see just why they work so well. You’re not playing through on hope - you’re battling through with skill. You’re not being struck down unexpectedly - you’re taking a risk and failing. Ori and the Blind Forest nails this feeling, it really does. 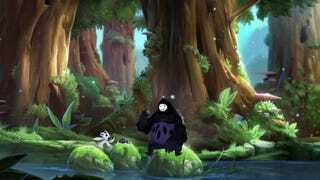 When you have a feature like Ori does - the ability to bounce off enemies and projectiles, pushing you off in one direction and the projectile/enemy in the opposite one, you need this level of reliability in the control. It took me no time at all to pick up the core concepts and a little bit longer to figure out how I should be using Ori’s powers to solve the little puzzles strewn through the demo level. But I can tell it’ll take a long time to master everything the game has to offer and to be able to run through it without intense concentration. So it’s got the jumping and controls bit down - tick that box off. What else is there? Well, one particularly interesting element is how you can set a checkpoint at pretty much any point in a level - but doing so uses energy, which is in limited supply. As such you’re able to have a restart point at the beginning of tricky sections if you want, or you can choose to risk it and go without, thus being sent further back in a level if you do indeed fail. Similarly, you can use the same energy supplies to attack enemies - meaning you really have (at least) three choices to make regularly. It’s not a huge element, but it is a nice risk/reward mechanic. The level I played ended with Ori’s version of a boss fight - a grand, exciting and actually quite terrifying escape from a huge torrent of uprushing water. You may have seen it in the trailer. If you have, you’ll know the person playing it made it look pretty easy. It is not pretty easy, as my multiple failures will tell you. But the key point to take away from that is, even though I did fail many times (many times), I wanted to keep on trying. I wanted to give it another go. And another go. And another go. But I am getting ahead of myself - it’s hard to be entirely sure how something is going to end up based off a brief hands-on session. But I know my instincts and I know my platformers - and my instincts are telling me Ori and the Blind Forest is going to be a truly great platformer.